Last year after the holidays I came across a great clearance deal—organic pumpkin was only $1 per can. I didn't know what I would do with it all, but I snapped up as much as possible since it didn't expire until sometime in 2017. Surely I could find a way to use 40 cans of pumpkin by then. It wasn't until a few weeks later I discovered that only half of my cans were actually pumpkin, the other half were pumpkin pie mix. Talk about a major doh! moment. I only make 1 pumpkin pie a year, what in the world was I going to do with 20 cans of pumpkin pie mix? I was pretty sure I couldn't be the only person on Earth to make this mistake, the cans for pumpkin and pumpkin pie mix look almost identical, so I turned to my trusty friend Google for answers. It turns out that there really aren't that many recipes out there that call for pumpkin pie mix. I'm sure that comes as a total shock to you, doesn't it? Not to be deterred I decided to follow someone's suggestion to make pumpkin bread out of it and it turned out fabulous. So, if you ever find yourself with a random can of pumpkin pie mix you now know what to do with it. Then again you could run out and buy one just to make this recipe—it's pretty tasty with a cup of chai or coffee. Preheat oven to 350 F. In a bowl combine sugar, unsalted butter, eggs, and pumpkin pie mix. Mix until well-combined, then add all-purpose flour, salt, baking powder, and baking soda. 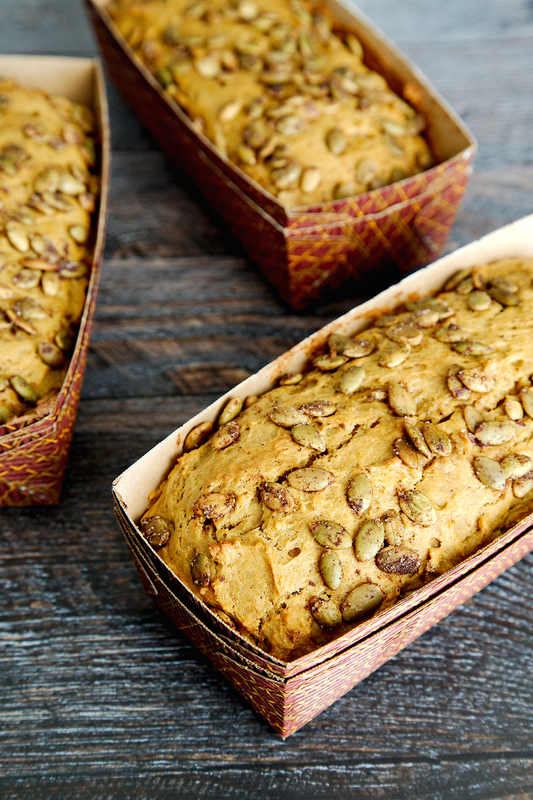 Stir until the dry ingredients are throughly incorporated, pour into loaf pan, and top with pumpkin pie spiced pepitas. Bake for 35 - 40 minutes in a preheated oven. Loaves are done when a toothpick inserted into the center comes away clean. Mini loaf pan sizes vary quite a bit, which means baking time will vary as well. I used 7"x2.5"x1.8" paper loaf pans for this recipe. If you use a different size pan or one made of metal you may need to adjust your baking time. Can't find paper loaf pans? You can purchase them on Amazon, but I found mine at Home Goods for a little bit less. This recipe came about after someone somewhere posted a really tasty looking recipe for banana split pancakes. How did I make the leap from pancakes to bread you ask? Well that's simple, I forgot to save the recipe and couldn't for the life of me remember where I had seen it. Talk about a major DOH moment. This is the point where inspiration struck, I was standing in the kitchen contemplating what I was going to make for breakfast since it wasn't going to be a nice fluffy stack of banana split pancakes when I noticed that I had a bunch of brown bananas sitting there. Hmm... I'll just make banana bread, no wait, what about banana split bread? Genius you say? Why yes I am! When I first started developing this recipe I remember mentioning it to my taste tester, who looked at me oddly and said, I didn't realize Banana Split Bread was a thing. My response of course was something along the lines of, well it's not, but I'm going to make it a thing, the next best thing since sliced bread (insert groan here.) After weeks of hard work it is now a thing, a truly amazing thing, so I hope you try it out the next time you have a bunch of bananas starting to brown. Preheat oven to 350°F and grease loaf pans with butter. In a bowl cream together softened butter and sugar, then add egg and mix until well incorporated. In a separate bowl combine flour, baking powder, and salt, then add to wet ingredients. Mash bananas, drain pineapple, dice cherries, and add to mixture. Fold in chocolate chips and walnuts, mix well before pouring into greased loaf pan. Bake for 60 - 70 minutes for a full loaf or 35 - 40 minutes for mini loafs. Check for doneness by inserting a toothpick in to the center of the bread. If it comes out clean the bread is ready to be removed from the oven. Allow to cool for 10 minutes before serving. Enjoy! If you are unable to fine pineapple tidbits you can also cut pineapple chunks into smaller pieces, but do not use crushed pineapple, it will affect the texture of the bread.